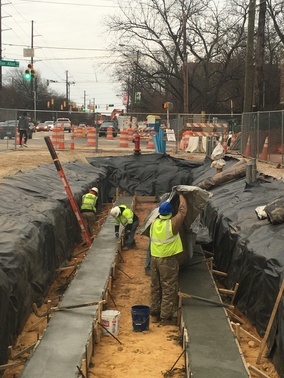 Welcome to the December 2016, edition of the Hillsborough Street Renewal, a monthly e-newsletter keeping businesses and residents along the corridor up to date on Phase II construction news. Currently, Duke Energy Progress (DEP) crews are outfitting the underground electrical vaults at the SKS property (Gumby’s Pizza, Fed Ex, and Jersey Mikes) and on Dan Allen Drive. DEP crews hit the ground running on Monday, November 28, at both locations, and are on schedule to be finished outfitting the vaults by January 4. The bulk of contaminated soil was removed from the corner of Shepheard Street and currently crews are installing storm drain inlets and pipes in that area. Contractors still ran into some contaminated soil as the storm drain system was going in, so this process was slowed down somewhat. However, the contractor was able to get across Shepherd Street with the storm pipes and no longer has to worry about the contaminated soil. 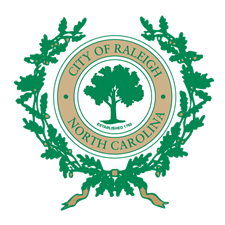 Crews are also installing the storm drain system on the south side of Hillsborough Street, running from Concord Street to Stanhope Avenue and in from Friendly Drive to the 2811 Building, between Dan Allen Drive and Zaxby’s. Recently they have started work on a rain garden in that location. The rain garden is an important storm water feature for this project, but will also add to the aesthetics of the streetscape. If the weather cooperates, contractors plan to have the rain garden built before Christmas. 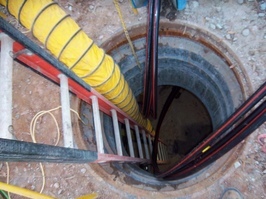 Carolina Conduit Systems has completed the underground electrical duct bank installation from Concord Street up to Stanhope Avenue and the connections to the Rosemary Street vault. 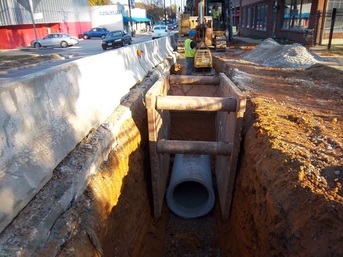 The underground electrical duct bank now runs from Gardner Street to Stanhope Avenue on the south side of Hillsborough Street. Watson Electrical has finished their work on the temporary traffic signals at Rosemary Street, Dan Allen Drive, Dixie Trail, Friendly Drive and Brooks Avenue. They will be back later in the project to install a temporary pole at Shepherd Street. The watermain along the south side of the street is now in operation from Gardner Street to Rosemary Street and night crews are working on the water services along the corridor to switch businesses and residence over to the new line. Duke Energy Progress crews will start service conversions, and the poles will come down on the south side of the street. Crews will also outfit the last vault on Rosemary Street. DEP is scheduled to be complete with their work at the beginning of February. Pipelines crews will continue to install the storm drain system along the south side of the street from Concord Street to Stanhope Avenue and the night crew will continue connecting the water services along the corridor. Shepherd Street will be a hub of activity for the next few months as contractors install the underground infrastructure including the storm drain system, the underground duct bank, sanitary sewer lines and water mains. Once the underground infrastructure is in place crews will start to reconfigure the area for the new Rosemary Street and Shepherd Street roundabout. Shepherd Street is now closed to through traffic and is scheduled to remain closed to through traffic for approximately three months, while contractors complete the installation of the new underground infrastructure mentioned above. To access Shepherd Street traffic can use either Daisy Street to Clark Street or Henderson Street to Clark Street. Rosemary Street will continue to see lane closures and occasional full closures while crews continue to install the storm water system in that area. To access Rosemary Street traffic can use Stanhope Avenue. Concord Street will remain closed as crews work on the underground duct bank in that area. We had a small turnout at this month’s Coffee Talk. City Project manager, Richard Dickie gave an update on the progress of the project, including Duke’s work in the underground electrical vaults. Mason Kennon from Pipeline Utilities was there to answer questions as well. Our next Coffee Talk will be held at the Stanhope on January 10, 2017, at 10 a.m. Coffee Talks are a great opportunity for the public to ask questions and voice their concerns about the project. We provide coffee and doughnuts or bagels and are available to talk in an informal setting about the project. We hope to see more faces at the next meeting.